Two UBC graduates are developing drone technology that could solve the problem of distant mid-air collisions and push the $127 billion drone industry into a new frontier. Artificial intelligence (AI) — once the stuff of science fiction — is fuelling the efforts of two Vancouver-based entrepreneurs to give industrial drones the ability to explore distant mining sites, search for missing people in remote locations and even deliver your favourite pizza. "Really, we're building collision avoidance for industrial drones," said Alexander Harmsen, CEO and co-founder of Iris Automation. "We see this huge need for industrial drones for mining exploration, pipeline inspection, agricultural surveying, forestry, or even package delivery." Without a way to avoid mid-air collisions, drones risk crashing into a Cessna, a flock of geese or a 747. Worst case scenario: a drone gets sucked into a jet engine causing catastrophic engine failure as high-velocity bits of metal penetrate fuel tanks, hydraulic lines and the cabin. Iris Automation's solution is an AI computer that blends real-time images and 3D maps to track incoming objects. "That's when it hijacks the auto pilot on board and spears it out of the way, or tells it to go for an emergency landing," said Harmsen. Harmsen graduated from UBC last spring, and after a brief stint with NASA's Jet Propulsion Laboratory, he started Iris Automation with fellow graduate James Howard. This summer, their team won a spot at Y Combinator, the Silicon Valley seed accelerator that has jump-started companies like Reddit, Dropbox and Airbnb. Iris Automation is just one of several companies racing to find the best technology to prevent mid-air collisions. Analysts predict the drone market to soar to well over $127 billion as unmanned aerial vehicles (UAVs) take over the work of airplanes, helicopters and even your local delivery service. But to do all of that, drone companies need to prove to regulators that their unmanned aircraft are safe. That means testing all kinds of commercial grade components to make sure they can survive in extreme weather and turbulence. One of the biggest problems is figuring out how to avoid mid-air collisions. "Some people call it the 'holy grail' of the UAV world," said Paul Di Benedetto, chief technology officer of Drone Delivery Canada, who plans to begin automated door-to-door deliveries by 2018. Di Benedetto said his company is busy testing drones and establishing a customer base in the lead up to changing regulations. Right now, Transport Canada only allows drone flights within line of sight — where the operator can see the airspace around the drone to make sure it won't collide with another aircraft. Once a drone goes beyond line of sight there is no pilot to look out the window and see what's coming. "The UAV has to be able to interact and react to what's going on out there," said Di Benedetto. "We need to ensure safety when you have a total loss of communication to this UAV." Di Benedetto said his company also has technology that will mitigate mid-air collisions, but that it's a secret because of an ongoing patent. Regulatory bodies around the world have been playing catch-up as drone technologies outpace rules that were built around manned aircraft. Canadian operators can expect new Transport Canada regulations to roll out in late 2017. But they are not expected to address flying beyond line of sight. "What we want to do is set that standard or that expectation and let the industry and the academic community strive towards it," said Aaron McCrorie, director general of Civil Aviation. But some think Canada is lagging behind while countries like Japan and online retailers have begun to deliver prescription drugs and bottles of wine. ​In the U.S., the Federal Aviation Authority (FAA) recently came out with a new set of rules to pave the way for the commercial drone industry. 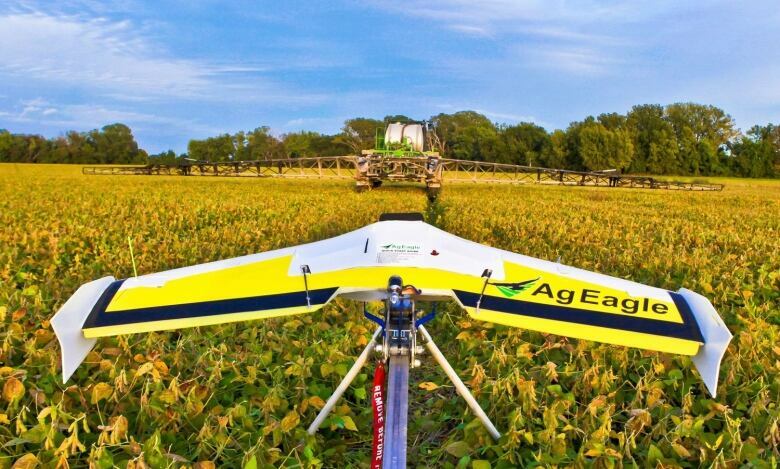 "Canada had a much more developed framework for about a decade, just like Europe and Asia," said Diana Cooper from Precision Hawk, one of three companies that are part of the U.S. Pathfinder program meant to test commercial drone technology. "CNN was chosen to figure out how to fly over crowds of people for newsgathering; BNS Railroads began flying beyond line of site for hundreds of kilometres in one direction for the purposes of inspecting railways; and then our company, Precision Hawk, was testing extended and beyond line-of-sight operations in an agricultural setting," said Cooper. 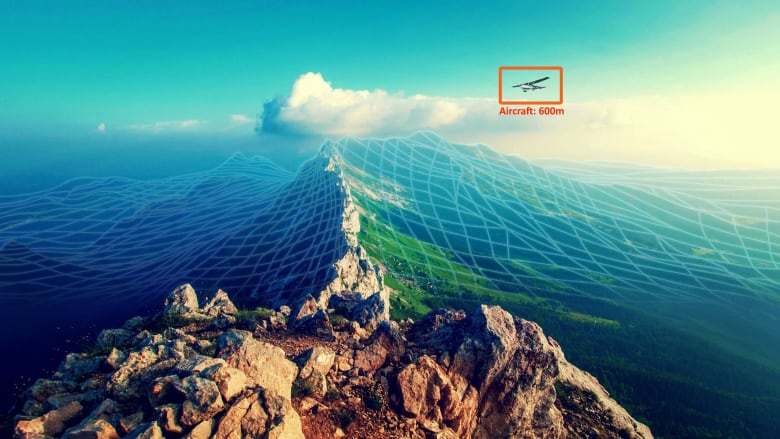 Their solution to mid-air collisions uses a combination of geofencing — a kind of digital wall that blocks drones from designated airspace — and tapping into an existing aviation network to provide real-time notifications when other aircraft approach a drone's airspace. But there are a lot of different ways to approach this problem. "Some guys will even go out and say 'hey, I'm going to deploy my own low-range radar system to be able to track things where drones fly,'" explained Di Benedetto. "And then they try to create a level of comfort for the regulators to say 'look, we've got technology scanning what's in the air, we can see any aircraft." But this is an expensive and impractical solution for anyone who wants to fly across a country the size of Canada. This is where Harmsen thinks his technology has an advantage. "We're making it very affordable, very lightweight, very energy efficient, so that really any of these industrial drones can have these modules on board," he said. Beyond the technology, Harmsen said there needs to be a cultural shift towards automation. "I think it's very similar to self-driving cars," said Harmsen. "We can build a number of statistical models to say that the risk of actually crashing into something else is reduced to one in a million," he added, "but having that human there in the cockpit, is still just so reassuring."